Kyle, Megan, and their two little ones see coffee as an adventurous commodity worth honoring. 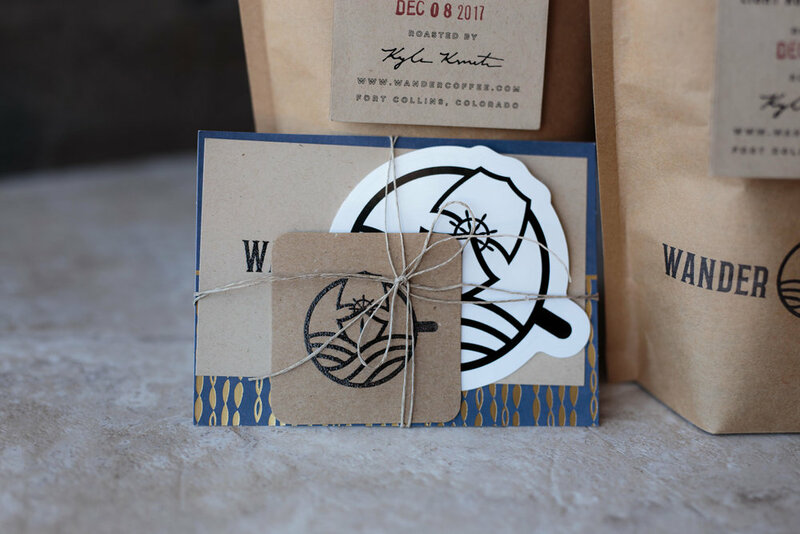 They are clearly committed to sustainable practices both in regards to the environment and the lives of those who work to produce the coffee. Built on a system of values, Wander Coffee seeks not only to provide high quality coffee, but to also do it the right way. Clearly, sustainability doesn’t have to come in ugly packaging. The website lists Megan as the creative director, so I’m assuming she’s the one I ought to compliment on their outstanding packaging. The attention to detail really impressed me. 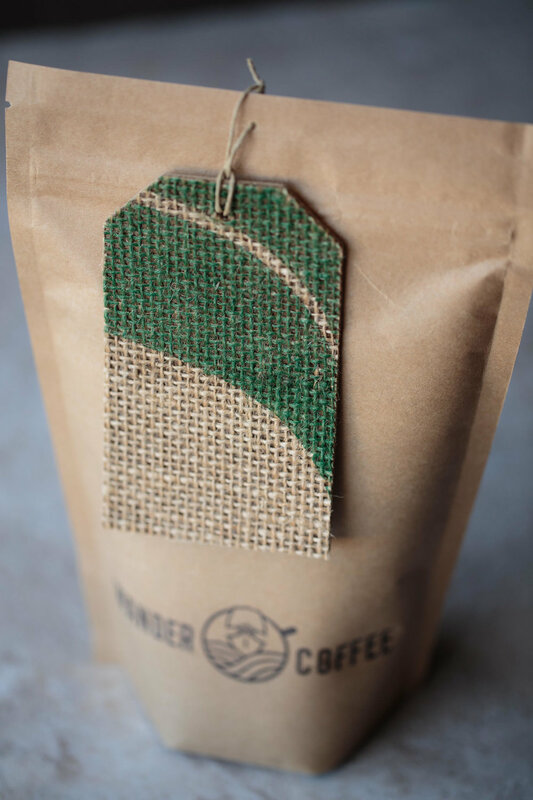 The bio-degradable zipper bags come adorned with handcrafted descriptive tags made from up cycled jute material and 100% recycled paper products. While the zippers were difficult to align at times, I really appreciated the resealable option built into the bag. Wander Coffee kindly sent me two of their single origin coffee offerings to try out, including the Ethiopia Banko Gotiti and the Guatemala Bella Carmona. This coffee has a really mellow profile with hints of mango and jasmine that give way to a sour lemon before settling into a ripe banana. The mild acidity and tea-like body remind of what I typically find in a washed process coffee. There’s an interesting roasted undertone throughout the palate that reminds me of baked pumpkin seeds I used to eat as a kid. While this coffee doesn’t have the vibrant volatility I tend to prefer in naturally processed Ethiopian coffees, its super mellow profile made this coffee really easy to sit and sip for long periods of time. Very little flavor shift occurred as the coffee cooled. This coffee greets the palate with notes of pistachios and honey with an underlying layer of toast. As the coffee moves to the back of the mouth the sweet honey notes become more prominent and caramel-like, similar to butterscotch, before leaving a grape-like aftertaste. A syrupy body and smooth mouthfeel really compliment the caramel-y sweet notes that dominate the profile. While neither of these coffees blew my mind, I definitely enjoyed both of them. As a whole, I’m definitely impressed with the brand Kyle and Megan built. I really appreciate their efforts in sustainability and integrity. Last I checked their online store, the Ethiopia was no longer available, but you can still buy a bag of the Guatemala Bella Carmona to try for yourself. Based on my experience, you can’t go wrong with any of their offerings. For those of you reading this before January 15th, 2018, you’re in luck. You can get 15% off your online order using the offer code “HAPPYHOLIDAYS” at checkout. If you live in Colorado or Wyoming, you may be extra lucky and get free shipping, check out their website to see which areas qualify! Thanks for reading! If you have any questions, comments or suggestions for future content leave a comment below or shoot me an email!